This beautiful town on the Costa Blanca that does not reach the 6,000 inhabitants belongs to the Comarca de la Marina Alta and is located at an altitude of 170m above the sea. A beautiful rural setting surrounded by almond and muscat grapes within the province of Alicante, located near the Cabo de Nao between the towns of Javea and Calpe. Benitachel is at a distance of 120km from Valencia to the north and south 80km from Alicante, both cities have international airports. The coastal area of this place has 2km of rugged coastline of great beauty. When the mountain of Puig Llorenç reaches the Mediterranean, it does so abruptly, forming spectacular cliffs and beautiful coves of crystalline waters. For hikers, Benitachel has several routes to enjoy the nature, sea and beautiful caves. The Cova dels Arcs is a beautiful natural rock cave with three arches bathed by the sea and are what give it its name. It is the gateway to diving routes to discover the caves with more than 1000m in length under the sea. If what you like is to walk and enjoy the scenery, from Benitachel you can take two routes, one is the Ruta de los Acantilados of an hour each way and another hour back that runs along the rugged coastline. As you can see, there are many reasons to visit this small town in the Marina Alta due to its culture, beaches, climate and the friendly people. But we cannot forget its rich cuisine. Sea products consist the most of the Alicantina cuisine. Dishes like "Cruet", one of the most typical of these lands are made of rich fresh local fish, potatoes and tomatoes. Also rice, as it could not be otherwise, is one of the star dishes of Benitachel. Some highlights are arroz a banda,arroz con sepia or putxero de pop. One of the most typical dishes of the area are the so called "cocas", a dish similar to the Italian pizza, with a single base made with a flour dough and added salt to which anchovies, eggplant and onion is added. The so called Caspell is another example of the rich heritage of Arab culture that inhabited this territory until the year 1609. It is a delicious sweet made with oil, flour, almonds and sugar, very typical of these lands. You cannot talk about gastronomy in Benitachel and not mention the famous Muscatel, a wine made with a high quality grape growing on these lands. This is a small township between the sea and the mountains. Benitachel is a typical Mediterranean town with an old flavor, perfect to wander through its narrow and steep streets typical of old Arab buildings. It is a pleasure to walk through the town to discover its rich cultural heritage as the Iglesia de Santa María Magdalena, a well preserved construction of neo-Baroque style located at the highest point of the municipality. We also find the Oratory of Jaime Llobeill, built in the 19th century. Not to mention the Costa and its beaches, rugged coastline where the cliffs form large wild beaches and coves of great beauty. The urban core in Benitachel is located on the inside but its Litoral has over 2 km of coastline bathed by waters of the Mediterranean where we find beautiful beaches and coves. Cala del Moraig is located just 5 minutes from Benitachel and has about 250m in length. It is a cove of great natural beauty away from the tourist areas, it is surrounded by steep cliffs and its waters are crystal clear. It has a bar. Cala de Llebeig is a small but beautiful cove about 100 m in length and an average width of 10 m. Cala Llebeig reach is not easy because it has no road access. Cala dels Testos is 150 m and is formed by the drain of Barranc dels Testos. If traveling by car either from Valencia or from Alicante we have the AP-7 motorway where we must take the exit number 63 onto N-332 / Gata de Gorgos / Benissa / Teulada. If we come from Valencia then the distance is 120 km and the trip will take us about 1 hour and 30 minutes. If otherwise you come from Alicante the ride is a bit shorter as the distance is about 75 km and will take you about 59 min to travel. If you travel by plane, Altet airport in Alicante is the nearest one located 80 km away or also you have Manises airport with good connections to major domestic and international destinations about 120 km from Benitachel. Benitachel is a small town in the interior of Alicante that we can visit on day trips from the nearby towns of Javea or Calpe. But if what we want is peace, tranquility, and want to stay in the same municipality, we have many options. Search our website, mark your travel dates and find multiple options to stay. 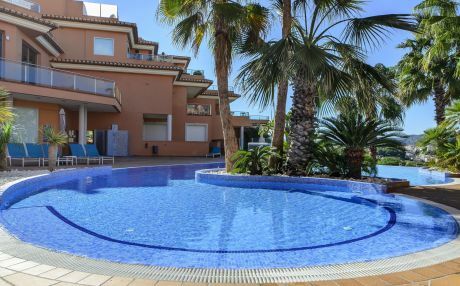 The housing is concentrated in the part of the coast where you will find a range from a cheap apartment in Benitachell to houses with private pools. Do not wait any longer and find the perfect accommodation for the whole family.